South of the impressive rock formations around Granite Pass, the Kelbaker Road crosses the boundary of the Mojave National Preserve at the interstate 40 junction, and 11 miles further meets what used to be part of Route 66 between Barstow and Needles (in Arizona), but is now known as the National Trails Highway. 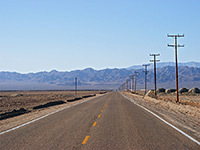 A short distance west of the junction is Amboy, a tiny settlement of about half a dozen people, once quite busy during the heyday of Route 66 but subject to an inevitable decline following construction of the interstate in 1972; now the town is nearly empty, with only a few buildings still occupied. Amboy presents an archetypal image of a dusty, deserted desert town, and has been featured thus in several movies, including the original version of The Hitcher (1986) - the most scenic spot is the 1950's style Roy's gas station, cafe and motel, the main center of the town. 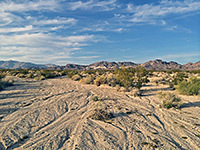 As of February 2016, all this area is part of Mojave Trails National Monument. 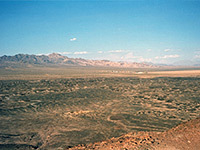 Amboy is set in a wide, desolate valley partly covered by a large area of lava, at the center of which is a distinctive black cinder cone crater. 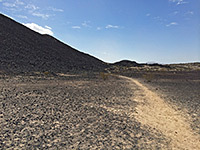 Amboy Crater, a National Natural Landmark, is about 1.5 miles from the road and can be reached by a path that is slightly longer, but allows an easier journey than walking directly as the lava surface is sharp and uneven. The starting point is a newly constructed parking area with information notices, rest rooms and picnic tables, at the end of a short side track branching off the main road. The basalt crater rises just 250 feet above the desert but this is enough to give a good view of the impressive, yet rather bleak surroundings, with Amboy clearly visible in the distance (5 miles away), the barren mountains of the Mojave National Preserve to the north, and more arid hills to the south. The crater is 1,500 feet in diameter, was formed about 6,000 years ago, and can be visited in quite an easy round trip of about 90 minutes. On the east side of the lava field, the land flattens out to a vast area of salt deposits at Bristol Dry Lake, site of an extensive chloride extraction plant. A short distance further west along old Route 66 is Bagdad, inspiration for another atmospheric film - Bagdad Cafe - though this was actually filmed at the Sidewinder Cafe in Newberry Springs, 50 miles to the west. There is more lava and another cone (the Pisgah Crater) 30 miles in the same direction. This general area is not quite as impressive as other Western volcanic locations such as Sunset Crater in Arizona or Craters of the Moon in Idaho, but it is still well worth visiting.